The Fort Worth business centre located in the Western Insurance Building. This facility is close to major freeways and located in a very desirable area. A range of business facilities with the use of meeting rooms are offered all within a great setting. Covering all your office needs from single rooms to multiple suites and everything in between this brand new construction is located with great access to the S garland Highway. All of the furnished suites have natural lighting while month to month leases are available for flexibility. Near to Alliance Airport this business center is surrounded by a range of fantastic dining and shopping options and has open-plan and furnished executive suite options suitable for professionals from any industry. The locality's exceptional variety of high quality transport links provide potential tenants with frequent and convenient services in operation across numerous road and rail networks, making the center easily accessible. 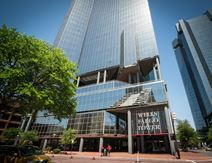 This center is located in a distinctive office tower, home to many leading corporations. The center is close to hotels, entertainment venues and financial institutions, and is well situated for access to the interstate. Parking is available for around 3800 cars. The regional transport links are also excellent and provide prospective tenants with a range of frequent and convenient transport options throughout the locality. This centre in Fort Worth near the Carter Burgess Centre. This comes equipped with high speed internet and telephony including fax usage, secretarial services including notary services with friendly staff and onsite banking and cafés. This state of the art business center installation is set in an extensive three-storey class A office building with a spacious reception area and impressive interior fittings. With convenient location on the north side of Forth Worth, this center is easy to reach and close to many useful amenities. Emerging economic sectors include semiconductor and communications equipment manufacturing, corporate offices, and distribution. Easy access to all highways and the busy downtown centre. This is offering well designed offices and well accented reception with a range of secretarial and conferencing facilities with the use of the tea-point, mail and janitorial services offered. These offices are located on the top floor of Park Vista Plaza, a mixed-use development located between I-35 and Denton Highway, making the center easily accessible. Situated in an executive and luxurious professional office tower location that has high prominence and is home to a number of leading corporations, this incredible office center is located less than two miles from key city destinations including the Colonial Country Club, the Cultural District, Fort Worth Zoo and Texas Christian University. The locality also provides excellent transport links and is a key commercial destination. This 12-storey red brick building provides state-of-the-art and exquisitely furnished workspace solution packages and flexible office space that benefits occupying tenants hugely from a prominent Fort Worth central business district location. Close to both the interstate and the Meacham International Airport, the center itself is ideal for your out-of-town clients and the multitude of local services in the area make this the perfect setting for tenants of any industry.